Travel with Kevin and Ruth! : New dinette table for Sherman... and we're off! 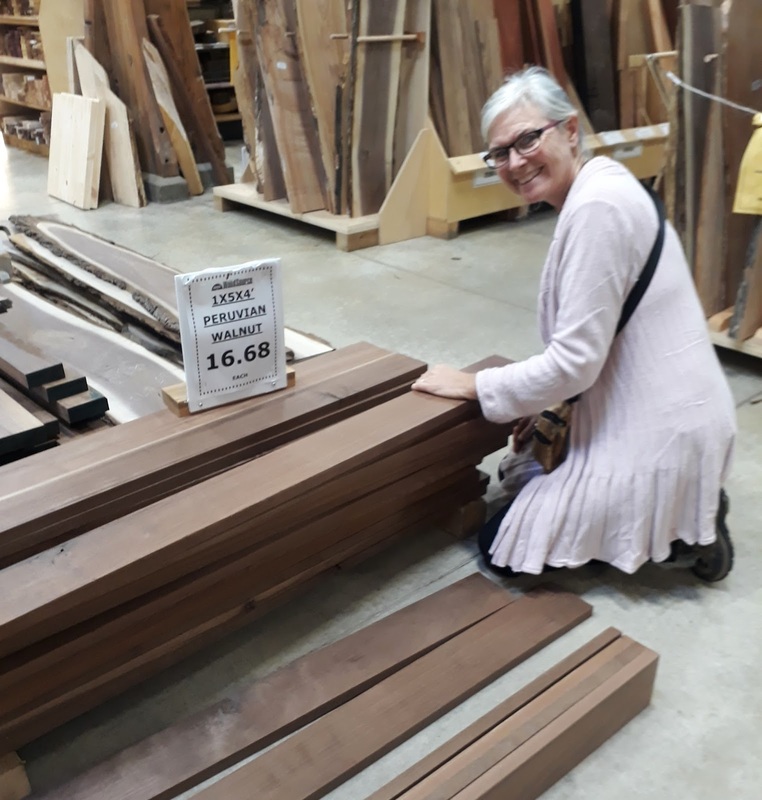 Ruth, choosing the wood for our new table. Son in law Justin, thinking about what he's going to build. It's too nice! We're afraid to put anything on it! Ha! No, it wasn't cheap. But we didn't want cheap! $133 for the wood, and $200 labor and materials. Sherman has a $333 CAD ($265 USD) dinette table, but we're really happy with it and we spend a lot of time at that table. That's pretty good actually, for a custom made piece of finely crafted furniture. Thanks Justin! And with that done, we're ready to leave. We've said goodbye to all of the family, and we don't plan on being back in Ottawa until late September next year. A little bit of rain hitting the roof right now, and it's supposed to be showers on and off all day. We'll cross the border at Ogdensburg, New York and head south through Syracuse. We have a couple of stops to make along the way... Sherman's shelves and cupboards need to be stocked, as does the booze cabinet. And we need to get a Verizon SIM card so that we can keep you up to date for the next 7 weeks that we will be in the United States. And we need to fill the fuel tank with some cheap American gasoline. We have enough in the tank that we can easily get across the border. And we're off... day one of our two year motorhome adventure! Next update coming from somewhere south of Syracuse, New York! RV trailer wheel stops... big price drop! If you are heading to Ithaca you probably have Watkins Glen on your to do list but if not I would HIGHLY recommend it. We just got back from a month of doing New England and that was my favorite stop! I'm sure you've seen the free boondocking sight 5- 10 minutes from there, I would give that an excellent review also. Happy travels! We might stop at Watkins Glen. Depends on the weather, but it's also a little bit off our route. Are you talking about Sugar Hill State Forest? If so, the website says they close the gate after October 3rd. Yes, I was referring to Sugar Hill. Sorry, didn't think about it closing, we were there end of September till Oct 1. Should of thought about it since we had some trouble finding open campgrounds towards the end of our trip. We were surprised so many were closing when it was still peak time for the leaves. Hey, we're in Savannah,Georgia right now. Heading to Nashville, Memphis then New Orleans and over to Laredo beginning of Dec. Maybe we'll meet up with you again? We should be in Nashville by the 24th or 25th, again depending on what the weather is doing. Then we're going to do a slow drive down the Natchez Trace Parkway. Yep, that would work, just keep in touch with us. Enjoy your winter there. What an adventure you are about to have! So looking forward to following along with you here. We have a trip to Tennessee, and also Kentucky, on the calendar in 2018, so it will be interesting to read your write ups once you reach there. Thanks Tamara! we are looking forward to our travels as well. We love traveling in Sherman. Not sure we will be a lot of help for watching our trip at least in Kentucky, it will depend on the weather, if it is still too chilly we will be moving down the road rather quickly. Love the table, welcome to the states, and travel safe. That's a beautiful piece of workmanship from your son-in-law. Good luck! WOW, that table is gorgeous!!!!!!! Beautiful! - with the added bonus of your family always being on your mind and in your heart when you sit at this lovely table. You are right we will be thinking of them every time we sit down here and admire it. Thanks Tommy, we are looking forward to this big adventure! Yes, Justin does fantastic work, we are really pleased with our new table. Great looking Table! Well worth the investment. Place mats will help to protect it. He sure is, that is why we let him do his magic! We are so happy with the results. Very nice, get one of those furniture pens from home depot to do touch ups to the table when need be for a stratch or dent. They work beautifully. Happy day one. We start our adventure of moving to Vancouver Island in two weeks! Good luck with your move, you both must be so excited! The table is beautiful! Now you need to update the table benches and cushions...looks like the benches just need to be restained and polished. 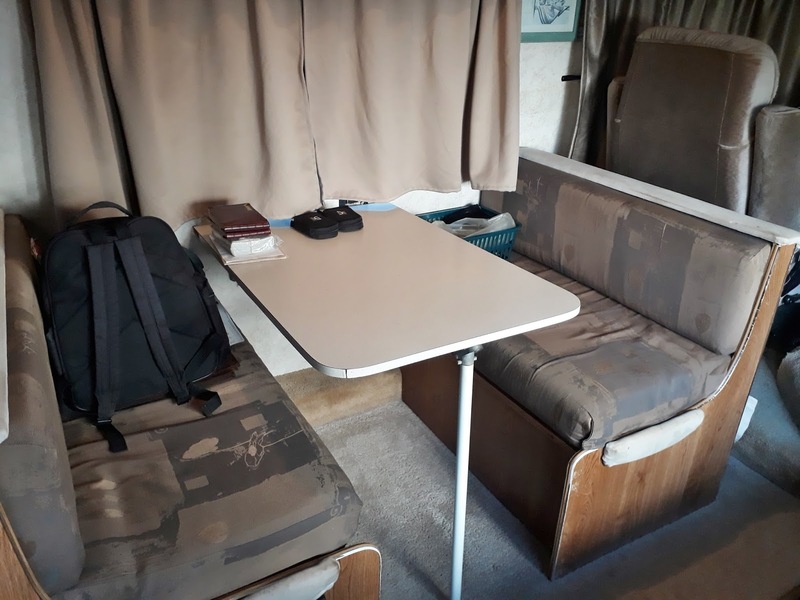 We had already recovered the dinette cushions a few years ago but we would like to do it again sometime soon. And yes, the benches themselves need to be replaced/painted. You can't re-stain these as it is only a fake covering (some type of plastic coating) over the cheap thin wood. Lovely woodwork. Wish we were allowed to stay longer than three months. You can always move between the USA, Canada and Mexico to lengthen your stay. Sherman is our home and yes we are very happy to be back in him and traveling again. Your son in law did a lovely job on the table, Travel safe and look forward to your next post, such an exciting adventure lies ahead enjoy! Well, we certainly got off to an interesting start to our adventure. Life is never boring with us. Wonderful looking table. Congrats to Justin....he did a beautiful job. Thank you Rose Marie, we think he did a fabulous job on it as well. Table is beautiful. Safe travels. I look forward to watching this adventure. We are off to Australia for 3 months and will rent a camper van there - smaller than Sherman. I am sure you will love your adventure in Australia. That is exactly the way we want to do Australia as well. Only one word to describe the table, beautiful! Safe travels and we hope to see you in a couple of months! Yep, that is a great way to describe it! I must admit I thought a new table was a waste of money but 'wow' is right. Love the table and I know that you spend a lot of time at it so why not.